Trying to organize a company-wide retreat can be fraught with difficulties. In addition to figuring out accommodations, food, and activities, you also have to determine the best way to get everyone to the destination. Letting your employees drive themselves might seem like a good idea, but that requires making sure that every vehicle that is capable of driving is filled with passengers by creating sign-up sheets. When people drive themselves, there’s also the possibility that everyone will arrive at different times, sometimes rendering your plans moot. Stack the likelihood that you’ll have to reimburse your employees for gas and mileage on top of the reasons mentioned above, and you start to realize how big of a dent transportation will make in the budget for your retreat. Or you could charter a bus from Michigan’s best charter bus company – Ground Travel Specialists. If you charter a bus with GTS, you’ll quickly realize how much stress is taken off of your shoulders. With our new fleet of buses, we’re able to carry as many people as you require. Simply tell your employees when and where the bus is leaving from and we’ll take care of the rest. When your company travels with GTS, you’ll travel in safety and in style and you’ll make it to your destination on-time, with everyone together. Not only will your company arrive at the same time, everyone will be well rested and relaxed from traveling in our buses. Each bus has a comfortable bathroom, seats that recline, power hookups so you can charge your phones or computers, individual reading lights, and screens so you and your employees can watch movies. We’ve done everything we can to keep our passengers relaxed and ready for whatever you have planned for them. By removing the discomfort and stress normally associated with travel, your team will appreciate not just the events at your company retreat, but the trip there as well. The entire experience then becomes more special and rewarding, instead of a fun time bookended by the drudgery and unpleasantness of traditional methods of travel. 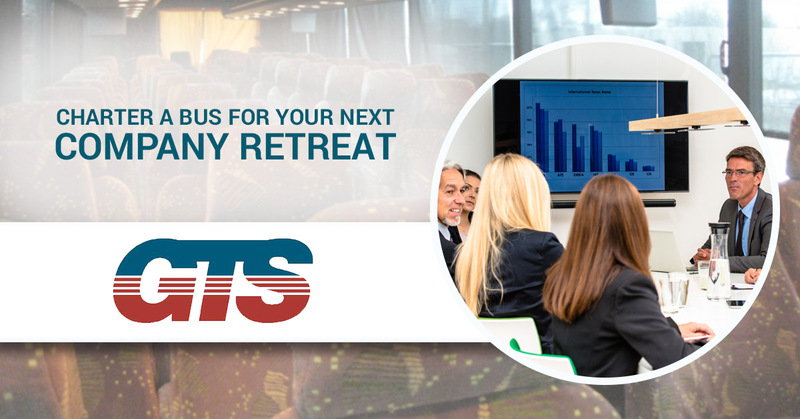 So if you’re looking for a way to reduce the stress of planning for all of the different parts of a company retreat, call Ground Travel Specialists today. We can remove one of the big stressors from the equation with one or more of our great charter buses.